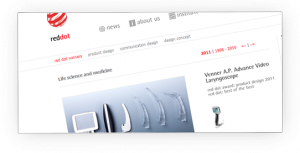 The Venner AP Advance Video Laryngoscope was the winner of the 2011 Red Dot Design Award in the field of life sciences and medicine! Our Venner A.P. 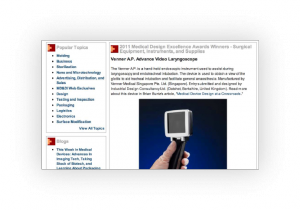 Advance video laryngoscope was the winner of the 37th Medical Design Excellent award in 2011 in the field of surgical equipment!! Designed by Industrial Design Consultancy Ltd. (Datchet, Berkshire, United Kingdom), the Venner A.P. Advance was able to convince its ability to significantly improve the user experience among many other aspects. The aim of the design firm was to provide the Venner A.P. Advance with a type of design which was able to incorporate the latest technological developments, while also being in a position to make the medical equipment easy and intuitive to operate both for teaching purposes, and when used in hospitals and clinics. So not only can it be used in normal situations, it is able to provide an overview of extreme cases too. Venner Medical would like to offer its thanks to the many participants and their creative ideas and suggestions. We are looking forward to many more successful Summer School Events! Mobile home care, a specialist service for cancer patients of the Ludwig Heilmeyer Tumour Centre, has set itself the task of building a bridge between the hospital and the home, with the objective of creating the best possible care for cancer patients at home. As a result of the tremendous levels of care and the 24 hour emergency response unit, the employees of “Mobile Home Care” are dependent on reliable vehicles. The vehicles are not funded by the hospital, therefore “Mobile Home Care” is a service which always relies on donors and sponsors. Venner Medical (Deutschland) GmbH is delighted that it can now offer CCCF home care support services to everybody! 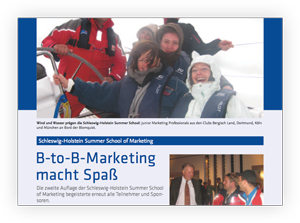 For the marketing industry, edition 7/2011, See Summer School of Marketing.